Butternut had her calf, Chickadee, this morning around 10:30am at the Dutchess County Fair. She was part of a special birthing exhibit. She was in labor for a long time. 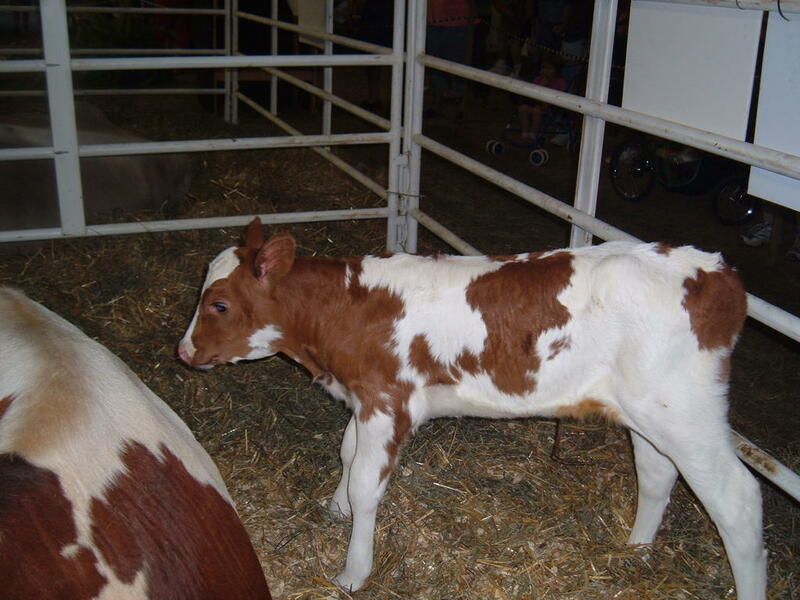 If a calf is born correctly, the first thing that is seen is a placenta that contains a lot of amniotic fluid. Finally the placenta breaks when a front hoof cuts through the placenta. The two front hooves then start to emerge. The hooves are followed by a nose, a head and then finally a calf. The calf typically weighs between 65-90 lbs. Butternut got to the step where one of the front hoofs had cut through the placenta. At this point the vet had pity on Butternut and several strong men had to pull Chickadee out from Butternut using chains that were attached to the calf's front legs. Many fair goers were present to marvel at the miracle of life.